The healthcare industry is all about communication between the provider and the patient, and when it needs to be immediate, rather than waiting until the next appointment, SMS texting has proven to be an extremely valuable tool. For example: patients can actually text their blood sugar level to their doctor and get instant feedback concerning their medication. Something as simple as text messaging can prevent serious complications and visits to the emergency room. Text messaging can be very beneficial to the whole industry - doctors, dentists, chiropractors, home care givers, and almost every other health care provider there is. There are so many ways to take advantage of this new technology in the healthcare industry that a whole book could be written on the subject, and probably will. Appointment reminders can be set up and scheduled to remind patients of their appointments. Thus reducing the number of no-shows and reducing the associated costs. Notices can be sent out from clinics reminding their patients of things like flu vaccinations being available next week. Health care providers can easily meet the HIPAA privacy regulations when using text messages to communicate with patients, and that allows the provider to maintain a personal line of communication, which is so important to the doctor- patient relationship. As with any other use of texting, the health care provider will first have to gather the mobile phone numbers with the patient's permission before the system can be of any use to them. This can be accomplished in a number of ways. Once you have a patient's cell phone number, personal messages can be used for appointment reminders, medication expiration reminders, and other needs for personal communication. 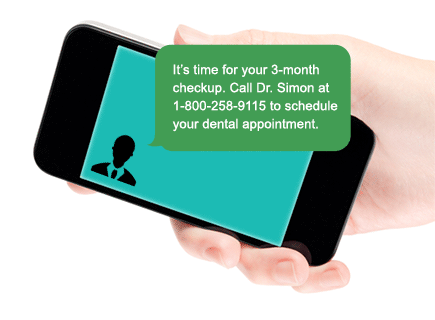 Additionally, you can now send messages to all of your patients at once using Text Blasts. These could be health tips, discount on a teeth cleaning, reminder that the health fair is tomorrow, appointment opening - first to respond gets it, and anything else you think is worth sending a message about. According to a study by PricewaterhouseCoopers' Health Research Institute, "Mobile technology holds great promise for keeping people healthy, managing diseases and lowering healthcare costs." Since SMS messages can be personalized when dealing with a patient's health, it works very well for the healthcare industry. It also helps patients to have an immediate connection with their doctors and other medical professionals.